Meanwhile, Anila Gyadi, bagged the first runner up, Miss Personality and Jyoti Waii, bagged the second runner up. 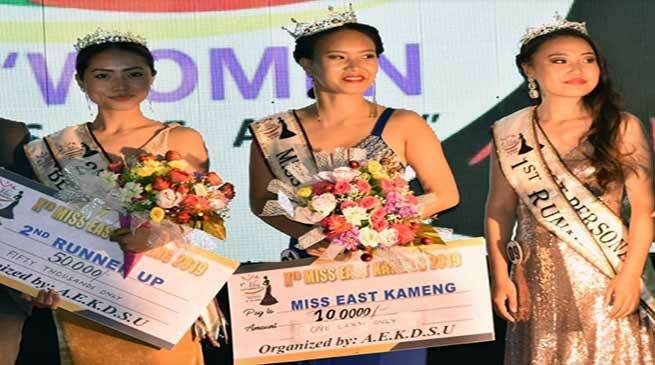 Sunita Tabri was crowned as Xth Miss East Kameng -2019 in the grand finale of the pageant held on Thursday last at Seppa. Sunita is a student of BA Tourism studying at Chandigarh. Meanwhile, Anila Gyadi, a student of the department of Sociology, RGU bagged the first runner up, Miss Personality and Jyoti Waii, a student of JNV Seppa of class XI bagged the second runner up with Miss photogenic and Miss beautiful smile. Sunita Tabri is the daughter of late. Tassang Tabri (Father) and Karmu Dodum Tabri (Mother) and hails from the Tabri village of Pipu circle from East Kameng district. She got her primary education from Kingcup Public school, itanagar. Speaking to Arunachal24 , Sunita said that though I have participated in college level display but this was my first attempt of any district based title. “I could have never been at this stature without the immense support by my mother, thus I give all the credit to her, my late. Father and family members,” she said. She also said that besides being a student of Tourism, she loved travelling, writing and aim to become an entrepreneur in life ahead. “Being a girl child I have always been taught to be self contingent, selfless and yet strong enough to overcome any obstacle in the life,” she added. “Participating in various pageants is one of my passions which I will continue in future too. Though I am much new to this field but I am positive with my thoughts that some or the other day my hard work will pay off and will represent the state in the national level,” she further added. The Xth Miss East Kameng was organized by the All East Kameng District Students Union (AEKDSU) where Miss Arunachal-2017, Osin Mosu along with Mr Arunachal Tarh Gungte and Principal Kameng Presidium School, Seppa Parvati Gyati were present as Judge.